Building sign for a university health clinic. 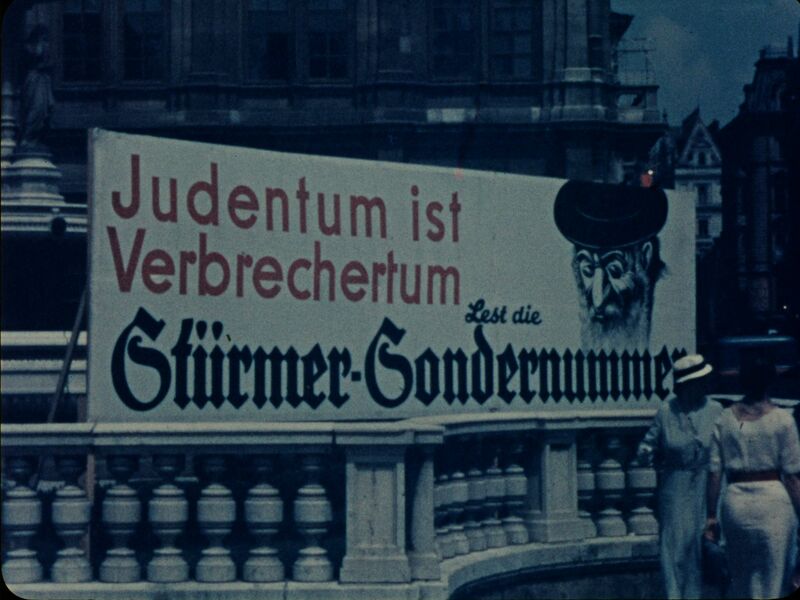 Pedestrians walk past the opera house with an antisemitic sign "Judentum ist Verbrechertum, Stuermer Sondernummer" ["To be Jewish is to be criminal. Read the special edition of Der Stuermer."] with a caricature of Jewish man. More graffiti on Jewish-owned shops as pedestrians walk by, including a red-painted "Jude" with X's, stars of David, and profile caricatures. Dr. Lafayette P. Monson (1902-1968) traveled on the Normandie ship from New York and arrived in Southampton, England on July 4, 1938. He departed on the Pan American Airways Phillippine Clipper from Manila, Phillippines on October 8, 1938 and arrived at Alameda airport in California on October 20, 1938. His wife, Margaret, died of pneumonia, on December 26, 1937. They had two children, Elizabeth and Joanne. Monson was born in Preston, Idaho and lived in Salt Lake City, Utah and Carson City, Nevada prior to living in California. He was a Mormon. In March 1939, Dr. Monson gave a "travel talk" at the Athletic Club in Oakland, CA titled, "India, Siam, and the Holy Land" with his color motion pictures. The 16mm film was shot by a San Francisco physician named L.P. Monson, who toured the world in 1938 after the death of his spouse. He shot several hours of Kodachrome, including this brief sequence in Vienna located on Roll 2. Rick Prelinger (Prelinger Archives) acquired the film from a descendant named Worthington, who told him that Monson had shot more but that the material was confiscated by the Gestapo. Other parts of this film roll were shot in Rome, Venice, (Vienna), Budapest, Belgrade, Bucharest, Sofia, and Istanbul. The United States Holocaust Memorial Museum obtained a digital copy of the film via the Austrian Film Museum in November 2011. A 35mm color dupe negative (blowup of Vienna sections) was made at JEA in 1998. Original file number PA-2170. Dr. Lafayette P. Monson traveled on the Normandie ship from New York and arrived in Southampton, England on July 4, 1938. He departed on the Pan American Airways Phillippine Clipper from Manila, Phillippines on October 8, 1938 and arrived at Alameda airport in California on October 20, 1938.